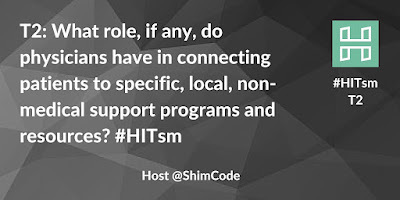 On Friday, June 17, 2016, “Addressing Healthcare via Non-Medical, Community-Based Resources and Tools” was discussed during the weekly #HITsm tweetchat. This is the 2nd post of a 6 part series presenting curated tweets from topics discussed in that chat. The 1st post can be found here. This post shares the discussion surrounding Topic #2.. I’ll share what was discussed the remaining topics via additional posts over the next couple days. Topic #2: What role do physicians have in connecting patients to local, non-medical support programs / resources? @shivam_mundra: Physician can play an important role, as in most of this situation they would be the first point of contact! @shimcode: Physicians should have a primary role - they just need to be compensated for time and effort. @mloxton: YES!!! Stunning lack of awareness in many providers. @matt_r_fisher: Not sure this burden can be put on #physicians. But if have care coordinator or similar person in office, then can do it. @sarahmlavoie: Agreed - and hard for physicians to change thought process - so much training to treat everything medically! @adamrichsearch: Challenging for providers in the current atmosphere. That is why the connection to community health workers is so vital. @healthiscool: I wonder how many docs know about reduced YMCA memberships and Farmer's Markets coupons 4 qualified population? 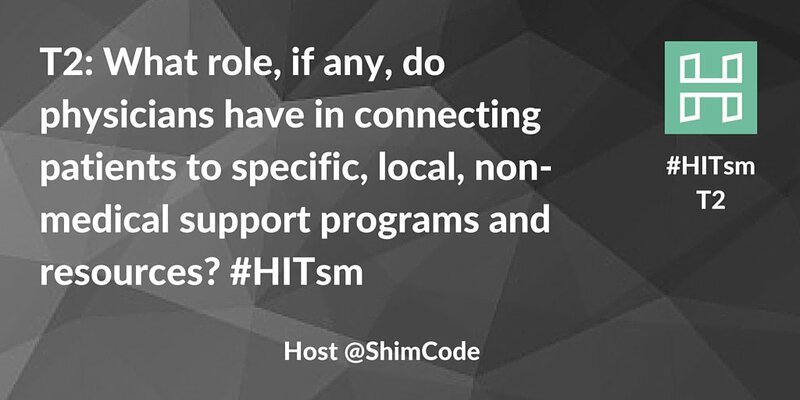 @shimcode: Some sort of neutral advocate available before/after patient appointments or hospital stays? @matt_r_fisher: I still say have right support person in office. Hard for #physician to know all of those resources. What can your Shopping Receipts Say about Your Health? @ebukstel: A doctor once reviewed a shopping receipt w/ pt for a couple of minutes. Connection / discussion great. @lesliecozatt: Interesting @Matt_R_Fisher Who has ideas for what kinds of purchasing data would correlate w/healthcare needs? @matt_r_fisher: I'll leave that a more data oriented mind. However, clues certainly in purchases, other activities. Topics #3 through #6 are Coming! I'm currently curating tweets from the remaining four topics that were discussed in the tweetchat and will post those over the next day or two. For more information on healthcare data, technology and services, consider following me on Twitter.